A new study documenting the negative effects of California's drought on an endangered lizard in the San Joaquin Desert provides a glimpse into the potential effects of future droughts expected in California as a result of climate change. The findings, published May 2 in the online journal PLoS One, may also provide guidance on how to buffer these negative effects to avoid species extinctions. Coauthor Barry Sinervo, professor of ecology and evolutionary biology at UC Santa Cruz, said the endangered blunt-nosed leopard lizard could face major losses of suitable habitat due to climate change. In the new study, Sinervo, UCSC graduate student Joseph Stewart, and collaborators at the Bureau of Land Management, California Department of Fish and Wildlife, and The Nature Conservancy looked at the effects on this species of the 2012-2014 drought, the most severe multi-year drought in southwestern North America in the past 1,200 years. “Based on our observations of range-wide collapse of recruitment during the drought, the future picture for the blunt-nosed leopard lizard is not all that rosy,” Sinervo said. The fieldwork for the study took place in the fall of 2014. Preliminary surveys of blunt-nosed leopard lizards in the San Joaquin Desert revealed that some populations failed to reproduce during the drought, causing concern about potential extinction effects on this critically endangered species. 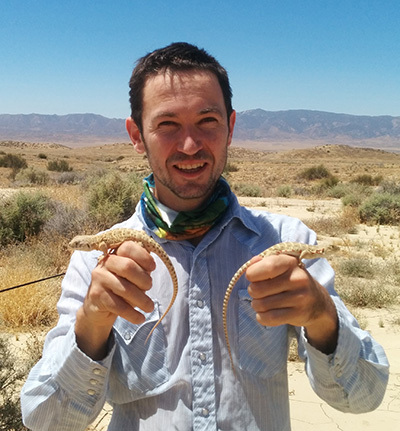 To determine whether this phenomenon was widespread or isolated to particularly vulnerable populations, the researchers rapidly deployed personnel to conduct surveys of all known blunt-nosed leopard lizard populations.